The speed tastings are bit reminiscent of speed dating. Where you have just mere minutes to make a favorable impression upon the person or in this case wine writer sitting near you. A few quick sniff, swirls, slurps and lots of reflexive spitting and you have just tasted about 16 different wines. No big, we are professionals, who gladly volunteer to have our palates assaulted by a platoon of frenzied red and white wines, coming at us with the zeal of crimson crusaders attempting to lay siege on our collective castle walls searching for unbridled abandon. Besides like Eric Asimov said during his keynote; "It takes an accumulation of bottles of experience to develop a point of view" to which I say; "bring on the juice". Many of my counterparts who attended the conference and some of those on the other side of the bottle were repulsed by the idea of speed tasting and like speed dating it of course is not for everyone. I frankly really like it, the excitement, wines coming at me at a frenetic pace, while trying to get some tasting notes written into precise bite-size hundred and forty character satchels of useful information. A lofty goal no doubt, but most of just leaned into and got with the program. Like many of the tastings I attend, whether it's at the Wine Bloggers Conference speed tastings, various meet and greet tastings or just your garden variety impromptu wine slurping fests it never fails to amaze me that I fall head over heals with some really fantastic juice. Many time it's a wine that I really had not anticipated sliding across my palate. But it's with great pleasure that I introduce you folks at Keswick Vineyards who stopped by the table where I was seated during the speed-tasting portion fo the day for red wines. They poured their 2007 Keswick Vineyards Cabernet Sauvignon, [Monticello] a blend of Cab-Sauv 75% and Merlot bringing up the rear. I was utterly unprepared for how amazing this wine would be, especially after over-hearing other VA winemakers say that how difficult growing and producing Cabernet Sauvignon can be and often is in Virginia [geez ya talk about site selection]. After the first splash down in my glass, the bouquet coming out of glass gave me my first clue that I was in for a real treat. After the first sip, I was really awe struck by the caliber of this wine, thinking to myself this has to be a Napa-Cab, but no this was a Virginia wine. It was big and rich, with an emphasis on up-front dark toast, with lots of bacon-fat, coffee and dark plum flavors, wrapped around some premium red licorice, leading into the long fleshing finish. Again, being not too good with hiding my initial impression, I looked at gentlemen pouring the bottle and exclaimed, "wow" [sorry I know unprofessional]. I really don't get to say that as often as I would like to, but I felt compelled to just blurt it out. I said again, "um, wait hold the phone, this is Virginia Cab-Sauv?" and he just nervously nodded yes [probably thinking duh?]. Folks this is seriously good juice, my initial impression of this wine is to give it a fat whopping score of 93 points. Now it appears this wine is no longer available for purchase [sigh], however based on my experience with this one wine I think it would be a great idea to stop-by and give their wines a swirl [ya feel me?]. When Samantha Dugan was asked by a wine salesmen "So what are you looking for in a wine?" she looked at him and quickly retorted, "Honesty, purity and pleasure....the same things I look for in anything I want to spend my life with". I just had to chuckle to myself, as I was reading here reply to the poor-guy just attempting to be helpful, posted to her Facebook wall. A very snappy comeback filled with enough stark to fill a barrel of wine. But one engendered from real-honesty, one that we all should as consumers of the vine should be looking for when choosing our next bottle of wine. 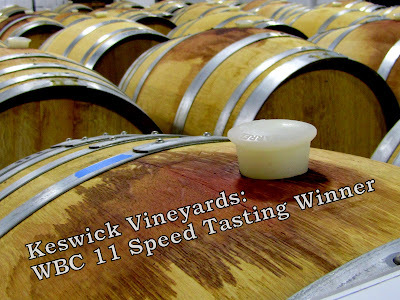 So kick those commodity wines I know you've been slurping on to the proverbial curb and get your palate over to Keswick Vineyards so you can experience some honesty, purity and pleasure. Until next time sip long and prosper, cheers!